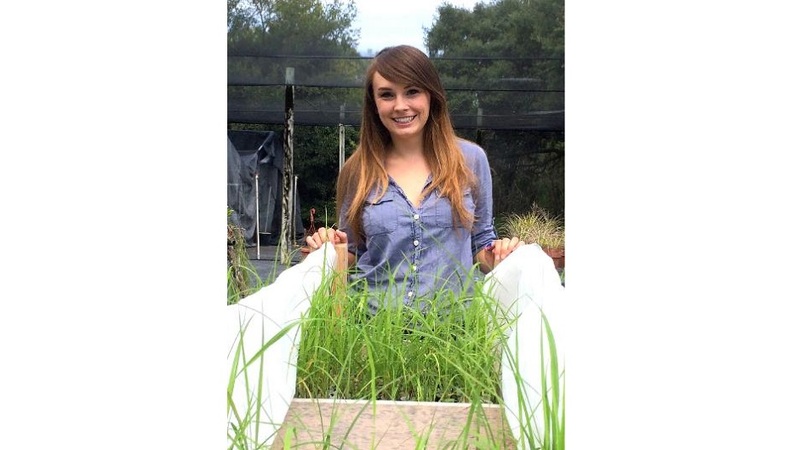 Joanna Weremijewicz, a biology Ph.D. student in the University of Miami College of Arts & Sciences, has received a Doctoral Dissertation Improvement Grant from the National Science Foundation to support her research on fungi that help plants absorb nutrients from soil. “80% of plants have these fungi in their roots,” Weremijewicz said, adding that they played an important role when plants first migrated from water onto land 460 million years ago. The fungi helped plants take up nutrients, which were scarce in young soils, mostly locked away in rock. These mycorrhizal fungi have a symbiotic relationship with plants. They live in plant roots, but spread out into the soil to collect nutrients (such as phosphorous and nitrogen) for the plants; in exchange, the plants provide the fungi with some of the sugars that they create through photosynthesis. When they are foraging in the soil, searching for nutrients to absorb, the microscopic fungi create networks of hyphae (filaments made of one or more cells). “If they encounter the root systems of other plants, they will colonize those roots, so the plants are all connected,” Weremijewicz said. Her research will investigate “if certain plants benefit more than others when connected by these fungi, or if everyone gets equal amounts of nutrients” – providing insight into plant competition. Weremijewicz will be working with two species of prairie grass: the dominant Big Bluestem, and the less common Canadian Wild Rye. Her goal is to determine how fungal networks contribute to competition among both highly competitive and less competitive species. She has designed and created special wooden boxes that hold 100 prairie grass seedlings, each in a slotted, fabric-covered cylindrical container. This innovative growing environment allows the fungi to penetrate into the soil, but keeps the roots inside the individual containers – ensuring that the plants are connected only by the fungal network. She can breaks the networks connecting the plants by rotating each individual cylindrical container. Weremijewicz will plant some boxes with only Big Bluestem, some with Canadian Wild Rye, and some with a mixture of the two. Each box will be grown with either intact or severed fungal networks. Students and faculty at Richmond Heights Middle School – an Agri-science magnet school, which is expanding its environmental sciences program in the 2014-15 school year – will be supporting Weremijewicz’s research. “The students will measure the plants every two weeks, practice testing hypotheses, graphing and presenting results,” she said. Weremijewicz established a relationship with Richmond Heights teachers two years ago through the Science Made Sensible program, a partnership between the University of Miami and the Miami-Dade County Public School System, which pairs graduate students in the sciences with middle school teachers. The program aims to enhance the teachers’ professional development, while improving the graduate students’ communication and teaching skills. The UM students and school teachers work together to create science lessons that build enthusiasm for science among the middle school youth. Weremijewicz enjoyed working with the public school teachers and students; she will continue this involvement this fall, when she joins the Fairchild Tropical Botanical Garden’s Fairchild Challenge educational outreach program. Through The Fairchild Challenge, students from elementary through high school conduct research, examine environmental issues, and learn to appreciate nature. The program promotes science literacy and civic engagement. Weremijewicz came to UM in 2010, after graduating from Loyola University in Chicago with a B.S. in biology. She expects to complete her Ph.D. in December 2015. Her dissertation supervisor is Professor David Janos. The Doctoral Dissertation Improvement Grant provides nearly $20,000 to fund one year of research. Weremijewicz will use part of the funding to hire and mentor undergraduate students to help her with the experiment.